How passionate are Jim and Audrey Newton about OLLI at Duke? Passionate enough to relocate from Florida to Durham, primarily to participate in the OLLI program. Lifelong learning has always been a priority for these retired educators who spent most of their lives in the Boston, Massachusetts area. Audrey and Jim met while they were both teaching at Lincoln-Sudbury Regional High School in Sudbury, Massachusetts. Later when the local Montessori school their children had been attending closed, they decided that the only way to provide comparable quality education for their children was to open a new Montessori school themselves. Audrey would be school administrator and teacher, while Jim would continue his teaching career at Lincoln-Sudbury. This was no small undertaking; first, Audrey had to become a certified Montessori teacher, which required instruction at an accredited Montessori training center. They chose the training center in Washington, DC, Jim was granted a sabbatical from his job, and they moved their young family from the Boston suburbs to an apartment in the nation’s capital for 13 months. Once certified and back in Massachusetts, Audrey devoted herself to getting the new school up and running, and they lived on Jim’s income alone for several years until the school was well established and Audrey allowed herself to take a salary. 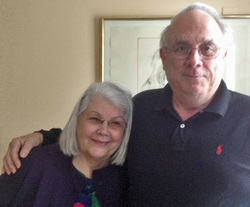 From that point on, they both enjoyed productive and fulfilling careers as educators – Audrey as founder, teacher and administrator of the Montessori school, and Jim as instructor and History Department chairman at Lincoln-Sudbury. After retirement, they moved to Florida to be close to Audrey’s mother; but after her death, they were looking for a new location to settle in – one that would offer a compromise in climate between the brutal winters of Massachusetts and the insufferable heat of Florida, and one that offered, as Audrey put it, “a life of the mind”. They narrowed down their search to OLLI programs at George Mason in northern Virginia, the University of Richmond, and Duke—and an informal meeting with Garry Crites about the OLLI at Duke program sealed the decision. Right now their volunteer efforts are focused on the upcoming OLLI Spring Retreat (April 6-9 at Trinity Center in Pine Knoll Shores, NC). The program reflects the intellectual curiosity and subject diversity that are hallmarks of OLLI at Duke, and includes a stimulating mix of provocative topics on history, nature, the universe, health, evolution and more. The Retreat Committee (which also includes Margaret Klein and Maddy Kalstein, and valued input from emeritus members Susannah Chabinak-Uhlig, Richard Ellman, Ed Eastman, and Tom Wolfe) has paid close attention to the feedback received from earlier Retreat attendees, and they’ve incorporated that feedback into the planning of the Spring Retreat – including a single, all-inclusive price, and alternative activities in case bad weather impacts a planned outdoor activity. For more details and updates, stay tuned to the OLLI Spring Retreat page.